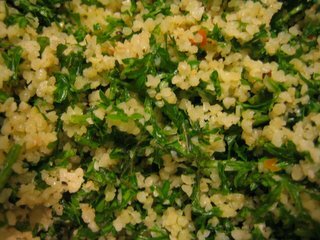 Tabbouleh, Tabouli or Tabouleh is a salad of Lebanese origin made with Bulgar wheat, parsley, mint, garlic, olive oil and lemon juice. Other flavourings are added such as salt, pepper, chilli, cumin, coriander, cinnamon and whatever else you might fancy. Tabbouleh is a quick and nourishing salad, made into a complete meal with the addition of some feta or char-grilled lamb, tomatoes and perhaps some cucumber. Tabbouleh is a lovely accompaniment to a pita-felafel-etc feast. The traditional recipes seem to lean the proportions towards the herbs rather than the Bulgar, but it seems to me that this depends on the amount of herbs available to you in comparison to the amount of Bulgar that you have already soaked. Regular Bulgar is really lovely, but for something with more bite, substance or body try to find some coarse Bulgar. Measure your Bulgar into a bowl, half a cup is a good amount for two people. Add the same amount of boiling water, stir with a fork, and cover with a plate or plastic wrap. Leave for a good 15 minutes and stir well again with fork. Leave until the water has been absorbed and the Bulgar is tender. Prepare a dressing with equal amounts of olive oil and lemon juice, plenty of crushed garlic, salt and pepper, and whatever other flavours you feel like. 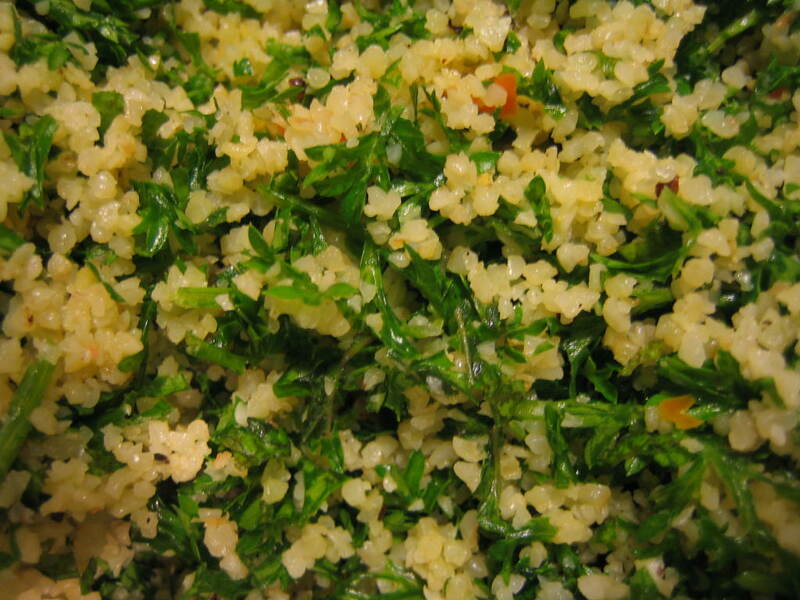 Add the dressing to the still warm Bulgar and leave to absorb while you prepare the herbs. Chop, as finely as you like, lots of parsley, mint, dill or whatever leafy green herbs you fancy. Add the chopped herbs to the Bulgar when you are ready to serve and mix well. Add other ingredients as you like and serve to enjoy.